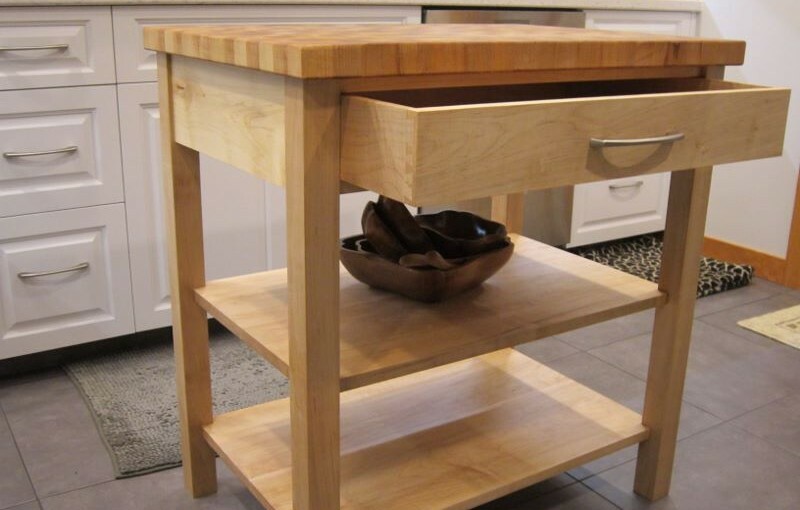 After helping build this client’s kitchen with Juniper Joinery, she wanted an island to add a little more work space. Because the kitchen was too small to accommodate a full-sized island, I came up with this option. The top measures 33″ x 22″ and is small enough to pick up and slide out of the way when needed. I designed the counter top to be a butcher block so the customer could use this space as a cutting board for preparing meals. A butcher block top is a great choice for cutting on, since the end grain of the wood doesn’t dull a knife as quickly as cutting across the grain. I also added in a couple of shelves for storing dishes, and as a special bonus, I added a drawer with hand-cut dovetails for the joinery. And I always give my clients green options when it comes to the finish on my furniture. This piece uses a combination of Osmo oil for the base, shelves and drawer, with food-safe tung oil for the butcher block top.